Below you'll find the past few Spirit of the West Shows. These links will open the show in Windows Media Player. If you don't have Windows Media Player click this link to download it. is available on You Tube here. Hugh's guest this week is Mike Sears. This week Mike Sears, rancher, cowboy horseman and hockey player talks about everything from how to set up a good branding, to playing hockey outside. Jonathan Field comments on the benefits of ranch work for a performance horse. Baxter Black has another jaw dropping story, there's great music an a terrific new piece of cowboy poetry. Hugh's guest this week is Matt Johnston. Hugh's guest this week is song writing, horse shoeing, colt-starting, guitar playing young cowboy. Matt Johnston who's shod the McLennan Ranch horses for many years shares some stories an real insight into horse behaviour. You'll hear a couple of his good songs including the favorite: "When The Last Calf Hits The Ground." 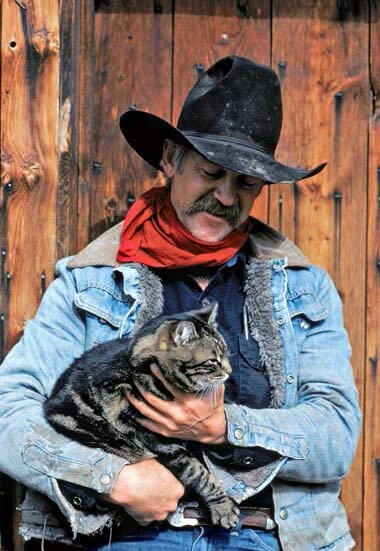 Baxter Black has another jaw-dropping true life adventure, there's The Rangeland News and good cowboy poetry too. Hugh's guest this week is Rod Olsen. This week Hugh Visits with Rod Olsen, a fine horseman who has a unique and very effective way with horses and people. Baxter Black shares what the steers might be saying about the ropers. Some brand new western songs will make their debut and there's cowboy poetry and some interesting items on the Rangeland News. One of Hugh's guests returning this week is Red Allison. This week it's more stories from the big cattle drives of recent times from a couple of cowboy legends, Gint Gillrich and Red Allison. There are some new songs of the west along with a long lost classic that you might be able to guess who sings it. Baxter Black, an interesting horse training subject, great cowboy poetry and much more this week. One of Hugh's guests this week is Red Allison. This show takes you back to the cattle drive of 2003 where Hugh visits with a couple cowboy legends from the crew. There's music that was inspired by those events and 2 very catchy songs that tell very different versions of the Battle of the Little Bighorn. Some cowboy poetry that hits close to home, horse training help that can keep you and your horse safe, Baxter Black and much more.